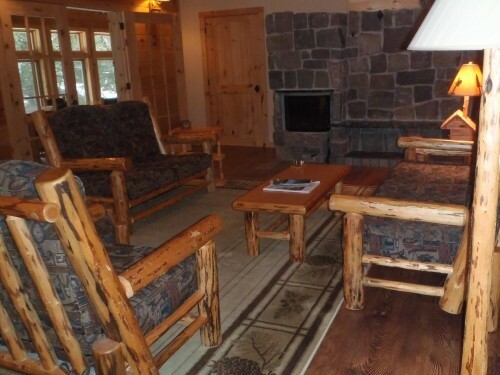 Our beautiful Adirondack log lodge consists of four bedrooms with private baths. Each room is finely appointed in lodge style, making for a cozy return at the end of the day’s adventure. 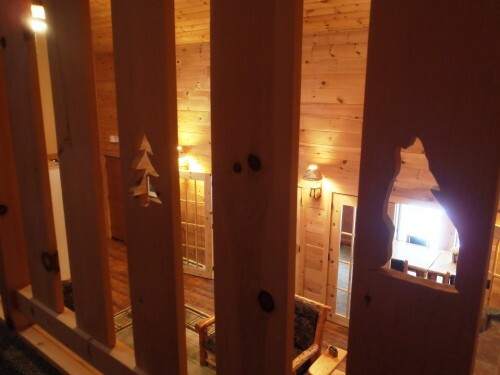 The first floor of the lodge is wheelchair accessible. A stately great room with an Adirondack granite-faced masonry heater gives one the opportunity to relax with other guests. In contrast, the study offers a peaceful retreat with connections by telephone and internet to the outside world. Rounding out the accommodations, our riverside dining room and screened porch allow guests to enjoy the sight and sound of the Oswegatchie River. The grounds encompass 300 feet of river frontage with a fire ring and park bench at the river’s edge. Wildflowers, tall pines and balsam firs grow throughout the property. A semi-circle drive makes arriving and departing with a boat or sled trailer convenient. Reservations are required. Our accommodations are for adults and children 12 years and older. We are smoke-free accommodation. Pets are not allowed. Guests with physical limitations are happily accommodated. Check availability for each room in the lodge by clicking in the drop down menu under “The Lodge” in the navigation bar above.